Abstract: There has been a significant and growing concern over nosocomial medical device infections. Previous studies have demonstrated that embedding nanoparticles alone (specifically, zinc oxide [ZnO]) in conventional polymers (eg, polyvinyl chloride [PVC]) can decrease bacteria growth and may have the potential to prevent or disrupt bacterial processes that lead to infection. However, little to no studies have been conducted to determine mammalian cell functions on such a nanocomposite material. Clearly, for certain medical device applications, maintaining healthy mammalian cell functions while decreasing bacteria growth is imperative (yet uncommon). For this reason, in the presented study, ZnO nanoparticles of varying sizes (from 10 nm to >200 nm in diameter) and functionalization (including no functionalization to doping with aluminum oxide and functionalizing with a silane coupling agent KH550) were incorporated into PVC either with or without ultrasonication. Results of this study provided the first evidence of greater fibroblast density after 18 hours of culture on the smallest ZnO nanoparticle incorporated PVC samples with dispersion aided by ultrasonication. Specifically, the greatest amount of fibroblast proliferation was measured on ZnO nanoparticles functionalized with a silane coupling agent KH550; this sample exhibited the greatest dispersion of ZnO nanoparticles. Water droplet tests showed a general trend of decreased hydrophilicity when adding any of the ZnO nanoparticles to PVC, but an increase in hydrophilicity (albeit still below controls or pure PVC) when using ultrasonication to increase ZnO nanoparticle dispersion. Future studies will have to correlate this change in wettability to initial protein adsorption events that may explain fibroblast behavior. Mechanical tests also provided evidence of the ability to tailor mechanical properties of the ZnO/PVC nanocomposites through the use of the different ZnO nanoparticles. Coupled with previous antibacterial studies, the present study demonstrated that highly dispersed ZnO/PVC nanocomposite materials should be further studied for numerous medical device applications. Of course, even with such a mechanistic understanding of the promoted mammalian cell responses on materials with nanofeatures, specific testing is needed for the present ZnO/PVC nanocomposites. 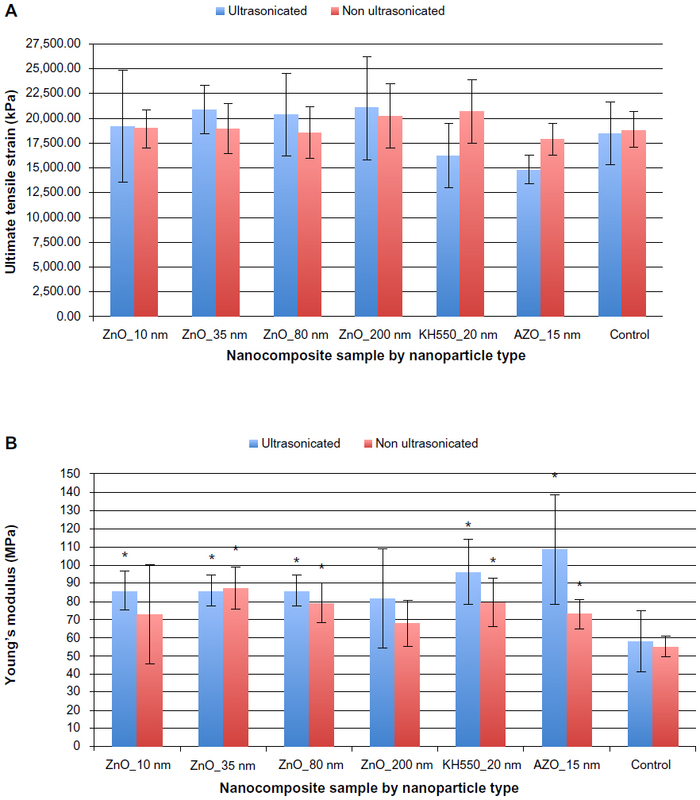 This is especially important since studies have reported mammalian toxicity of Zn at concentrations >225 mg, which is well below the amount included in the present composites.11 Results of this study demonstrate for the first time significantly greater fibroblast proliferation on ZnO/PVC nanocomposites with a greater dispersion of ZnO nanoparticles through the use of ultrasonication and functionalized ZnO nanoparticles, which when combined with the aforementioned antibacterial properties of such composites, indicates they should be further studied for numerous medical applications. In order to produce ZnO/PVC nanocomposites, medical grade PVC (taken from a commercial Sheridan® 6.0 mm ID uncuffed endotracheal tube; Hudson RCI, Temecula, CA, USA) was dissolved in cyclohexanone (Sigma-Aldrich, St Louis, MO, USA) at a ratio of 1g PVC:6 mL cyclohexanone with the aid of mechanical stirring and heating to 80°C on a hotplate. Once the PVC was completely dissolved, ZnO nanoparticles with diameters of 10–30 nm (labeled 10 nm), 35–45 nm (labeled 35 nm), 80–200 nm (labeled 80 nm), and <200 nm (labeled 200 nm); 15 nm ZnO nanoparticles doped with 2 wt% aluminum oxide (labeled AZO); and 20 nm ZnO nanoparticles coated with 1 wt% KH550 (a silane coupling agent; US Research Nanomaterials, Houston, TX, USA) (labeled KH550) were added to the mixture at 15 wt%. ZnO nanoparticles functionalized with silane were chosen since such a functionalization should improve the dispersion of the nanoparticles in PVC. Control samples were prepared in the same manner, minus the addition of any nanoparticles. The mixtures were stirred for 15 minutes until visibly homogenous. Then, some of the samples were placed in an ultrasonicator (BioLogics Ultrasonic Homogenizer Model 150VT; BioLogics Inc, Manassas, VA, USA) at 45–60 W at 20 kHz for about 3 minutes to ensure an even distribution of the nanoparticles. Samples either ultrasonicated or not were then pipetted onto glass slides (Thermo Fisher Scientific, Waltham, MA, USA) and were allowed to dry overnight in a chemical hood. Samples were then sterilized before all subsequent testing by soaking in 70% ethanol for 1 hour. The nanocomposite surface topographies were imaged using an SEM (Hitachi S4800, 3.0 kV accelerating voltage; Hitachi Ltd, Tokyo, Japan) according to standard operating procedures. The samples were coated with a 4 nm layer of palladium (Pd) using a sputter coater (Cressington 208; Cressington Scientific Instruments Ltd, Watford, UK). Backscatter images were taken of the samples to confirm that the surface features were caused by the ZnO nanoparticles. To determine the mechanical properties of composites, 35 mm × 9 mm ZnO/PVC samples were fabricated, held with 10 mm gaps between clamps, and were pulled apart at 0.33 mm/second by a mechanical tester (Instron 5943; Instron, Norwood, MA, USA) until they failed. The machine recorded the extension and load, which was used to calculate the strain and stress and find the ultimate tensile strain and Young’s modulus for each composite. To determine fibroblast proliferation on the samples of interest, 12 mm diameter PVC/ZnO nanocomposites were placed into 24-well plates, sterilized with 70% ethanol (Sigma-Aldrich) and washed twice for 3 minutes each with phosphate-buffered saline (Sigma-Aldrich). Human skin fibroblasts (line: Detroit 551; American Type Culture Collection, Manassas, VA, USA) were washed with phosphate-buffered saline, trypsinized from a T-25 flask with 5 mL of weak trypsin (0.001%), and then incubated for 3 minutes at 37°C. After that, 1 mL of fetal bovine serum was added to supplement the 0.25 mL fetal bovine serum that existed in the 5 mL fibroblast growth media (consisting of 94% Eagle’s Minimum Essential Medium, 5% fetal bovine serum, and 1% penicillin/streptomycin) (Life Technologies, Carlsbad, CA, USA). The cells were then mixed 20 times with a micropipette, transferred to a 15 mL Falcon tube, and centrifuged for 3 minutes at 1,200 rpm. The previous media was aspirated and the cells were re-suspended in 5 mL of fibroblast growth media. The cell density was established through the use of a hemocytometer and each well plate was seeded with 1 mL at a density of 10,000 cells/mL (or 10,000 cells per sample). The cells were cultured for 18 hours. The samples with adherent cells were transferred to a fresh well plate and washed with phosphate-buffered saline. New growth media (1 mL) was added to each well as well as 150 μL of the methylthiazol tetrazolium dye. Per the manufacturer’s instructions, the samples were incubated for 5 minutes at 37°C and were stopped with the addition of 1 mL of a stop solution N,N-dimethylformamide and sodium dodecyl sulphate provided by the manufacturer (Life Technologies). From each well, 200 μL was transferred to four wells of a 96-well plate and the plates were read by a spectrophotometer (SpectraMax® M3; Molecular Devices LLC, Sunnyvale, CA, USA), from which the final cell density was calculated using a standard curve. For the mechanical tests, numerical data were analyzed for significance using Student’s two-sample t-test, comparing each nanoparticle group against the control group (no nanoparticles). Five samples of each nanocomposite type were tested (N=5). Values are reported as the mean ± standard deviation. For the fibroblast proliferation assays, numerical data were analyzed for significance using Student’s two-sample t-test, comparing each nanoparticle group against the control group (no added nanoparticles). Three samples of each nanocomposite type were utilized during each run of the experiment, which was repeated in triplicate (N=3, n=3). Values are reported as the mean ± standard deviation. Figure 1 Scanning electron microscope images of the ultrasonicated zinc oxide/polyvinyl chloride nanocomposite samples. While all nanocomposites exhibited some agglomeration, the 10–30 nm, 35–45 nm, and KH550-functionalized nanocomposites displayed visibly finer nanofeatures than the other samples. Moreover, the KH550-functionalized nanoparticles provided the best nanocomposite dispersions in polyvinyl chloride. Abbreviations: AZO, zinc oxide nanoparticles doped with 2 wt% aluminum oxide; KH550, zinc oxide nanoparticles coated with 1 wt% KH550; ZnO, zinc oxide. 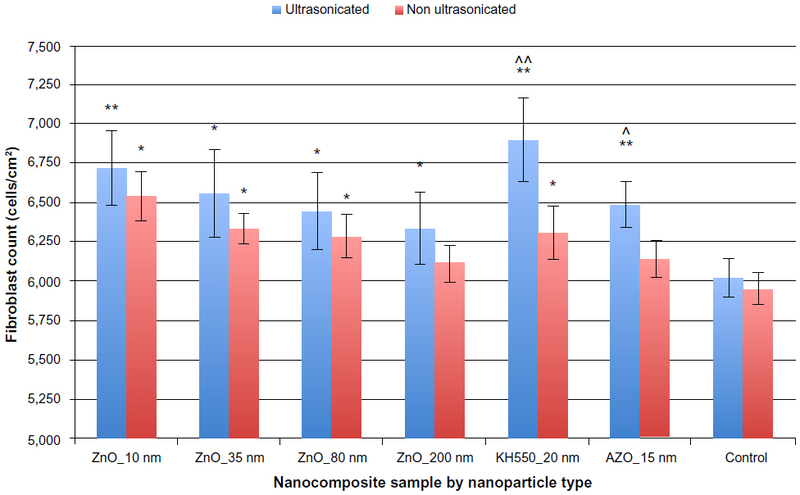 Mechanical test results demonstrated the ability to begin to control mechanical properties, matching those needed for a wide range of medical device applications, by using ultrasonication or not, by using functionalized or unfunctionalized ZnO particles, or by using different ZnO nanoparticle sizes (Figure 2). Figure 2 Mechanical properties of the zinc oxide/polyvinyl chloride nanocomposite samples. (A) Ultimate tensile strain and (B) Young’s modulus of the nanocomposites. Notes: Data represents the mean ± standard deviation; N=5; *P<0.05 compared to respective controls. Lastly, water droplet results further confirmed the SEM results of the different degrees of ZnO nanoparticle dispersions in PVC (Figure 3). 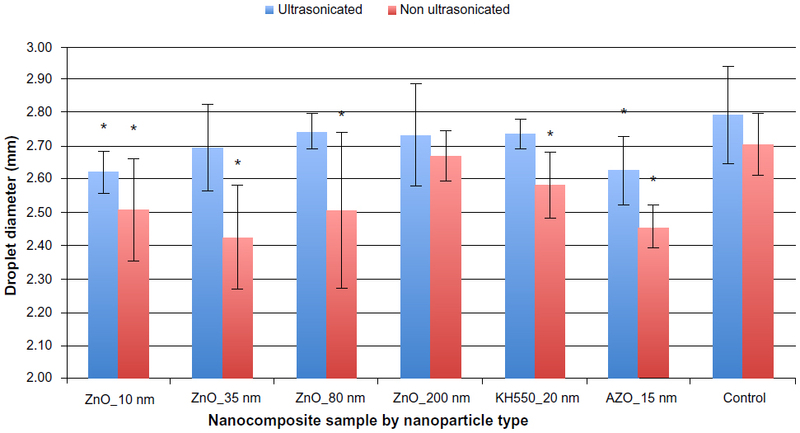 Generally, samples which possessed greater dispersion of ZnO nanoparticles (through the use of ultrasonication, different chemistries of ZnO nanoparticles, or smaller sizes of ZnO nanoparticles) had greater wettability than those that were not ultrasonicated. In addition, all of the ZnO nanoparticle samples were generally less hydrophilic than controls (pure PVC). Figure 3 Wettability of the zinc oxide/polyvinyl chloride nanocomposite samples. The diameter of a 5 μL water droplet was measured on the surface of the nanocomposites. Notes: Data represents the mean ± standard deviation; N=5; *P<0.1 compared to respective controls. 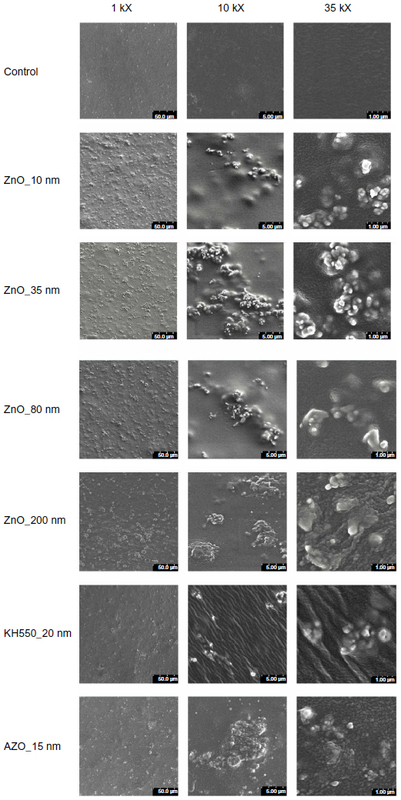 Results of this study provided the first evidence of greater fibroblast proliferation on PVC composites with ZnO functionalized with silane chemistry, ZnO with aluminum oxide, and samples of decreasing ZnO nanoparticle sizes (Figure 4). In general, samples which were ultrasonicated to possess a greater dispersion and enhanced wettability than those that were not sonicated, promoted fibroblast proliferation more than those which were not ultrasonicated. Lastly, when compared to controls (no ZnO), fibroblast density was generally greater on any sample with ZnO. Figure 4 Fibroblast proliferation on the zinc oxide/polyvinyl chloride nanocomposite samples. Notes: Data represents the mean ± standard deviation; N=3, n=3; greater fibroblast proliferation was observed when compared to respective controls (*P<0.05; **P<0.01) and respective non-ultrasonicated samples (^P<0.05; ^^P<0.01). An inexpensive material that is simultaneously beneficial to human cells and detrimental to bacteria would be a wonderful material for medical devices (eg, wound healing devices, orthopedic soft tissue devices). It is intriguing to ponder why fibroblast proliferation increased on ZnO/PVC nanocomposites with smaller nanoparticles yet bacterial adhesion and propagation decreased on such samples. Certainly for explaining the fibroblast trend, the smaller nanoparticles created visibly finer features on the surface and thus increased surface area; because there are more of smaller nanoparticles per weight ZnO, there are certainly more places for cells to attach. However, this increase in surface area cannot be used to explain the decrease in bacterial adhesion and growth;12 thus, a different mechanism must be used to explain these trends. Other studies have examined the optimal spacing of such nanofeatures for cellular behavior,13 which would need to be explored in the future for the present materials; however, such trends highlight the importance of controlling ZnO nanoparticle dispersions towards controlling cellular functions. Nonetheless, the authors believe another mechanism is at work here. Although requiring additional experiments for the present materials, it was observed that changes in wettability for nanomaterials leads to altered adsorption and bioactivity of proteins (eg, fibronectin, vitronectin) known to promote fibroblast and decrease bacterial adhesion.10 In the present study, a diverse relationship between the presence of ZnO and the extent of dispersion of ZnO to wettability was found. Specifically, wettability decreased when adding ZnO to PVC. However, wettability increased when dispersing such ZnO nanoparticles. This needs to be further understood in future studies. Of course, another possibility for the current cellular trends could be the favorable interaction of Zn with fibroblasts versus the detrimental effect of Zn with bacteria.11 Thus, future studies will need to correlate the ZnO amount present in the composites to the release of Zn into the cell culture media to the promotion of fibroblast functions and inhibition of bacterial functions. Whatever the mechanism, the results from the present study certainly provide much promise for the use of ZnO/PVC nanocomposites with well dispersed ZnO to increase fibroblast density while decreasing bacterial growth without the use of antibiotics. In this study, ZnO nanoparticles of varying sizes (from 10 nm to >200 nm in diameter) and functionalization (including no functionalization to doping with aluminum oxide and functionalizing with a silane coupling agent) were incorporated into PVC either with or without ultrasonication. Results provided the first evidence of greater fibroblast density after 18 hours of culture on the smallest ZnO nanoparticle-incorporated PVC samples with ultrasonication dispersion. Specifically, the greatest amount of fibroblast proliferation was measured on ZnO nanoparticles with silane coupling which had the greatest dispersion of ZnO nanoparticles. Mechanical tests also provided evidence of the ability to tailor mechanical properties of the ZnO/PVC nanocomposites through the use of the different ZnO nanoparticles and dispersion. In summary, coupled with previous antibacterial studies, the present study demonstrated that highly dispersed ZnO/PVC nanocomposites should be further studied for numerous medical device applications. The authors would like to thank Northeastern University, Boston, MA, USA for funding. Antimicrobial resistance fact sheet no 194. Geneva: World Health Organization; 2013. Available from: http://www.who.int/mediacentre/factsheets/fs194/en/. Accessed October 28, 2013. Fears R, van der Meer JW, ter Meulen V. The changing burden of infectious disease in Europe. Sci Transl Med. 2011;3(103):103cm30. Geilich BM, Webster TJ. Reduced adhesion of Staphylococcus aureus to ZnO/PVC nanocomposites. Int J Nanomedicine. 2013;8:1177–1184. Wood MA, Wilkinson CD, Curtis AS. The effects of colloidal nanotopography on initial fibroblast adhesion and morphology. IEEE Trans Nanobioscience. 2006;5(1):20–31. Kim P, Kim DH, Kim B, et al. Fabrication of nanostructures of polyethylene glycol for applications to protein adsorption and cell adhesion. Nanotechnology. 2005;16(10):2420–2426. Liu H, Webster TJ. Nanomedicine for implants: a review of studies and necessary experimental tools. Biomaterials. 2007;28(2):354–369. Puckett SD, Taylor E, Raimondo T, Webster TJ. The relationship between the nanostructure of titanium surfaces and bacterial attachment. Biomaterials. 2010;31(4):706–713. Colon G, Ward BC, Webster TJ. Increased osteoblast and decreased Staphylococcus epidermidis functions on nanophase ZnO and TiO2. J Biomed Mater Res A. 2006;78(3):595–604. Khang D, Kim SY, Liu-Synder P, Palmore GT, Durbin SM, Webster TJ. Enhanced fibronectin adsorption on carbon nanotube/poly(carbonate) urethane: independent role of surface nano-roughness and associated surface energy. Biomaterials. 2007;28(32):4756–4768. Lai JC, Lai MB, Jandhyam S, et al. Exposure to titanium dioxide and other metallic oxide nanoparticles induces cytotoxicity on human neural cells and fibroblasts. Int J Nanomedicine. 2008;3(4):533–545. Taylor E, Webster TJ. Reducing infections through nanotechnology and nanoparticles. Int J Nanomedicine. 2011;6:1463–1473. Arnold M, Cavalcanti-Adam EA, Glass R, et al. Activation of integrin function by nanopatterned adhesive interfaces. Chemphyschem. 2004;5(3):383–388. Bacakova L, Filova E, Parizek M, Ruml T, Svorcik V. Modulation of cell adhesion, proliferation and differentiation on materials designed for body implants. Biotechnol Adv. 2011;29(6):739–767.